URBANA, Ill. – For many soybean producers, the 2017 growing season will be a hard one to forget. 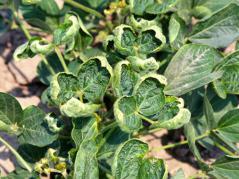 Widespread dicamba use in dicamba-resistant soybeans caused equally widespread off-target damage. The United States Environmental Protection Agency (EPA) has issued amendments to XtendiMax, Engenia, and FeXapan labels, but Aaron Hager says the amendments won’t be enough to ensure success in the 2018 growing season. “The intent of these label amendments is to reduce sensitive plant species exposure to dicamba primarily through physical movement (i.e., drift during the application or particle movement during temperature inversions) or via dicamba residues dislodged from application equipment, but because labels don’t include language to prevent volatility, there will still be risk of off-target exposure,” says Hager, weed scientist in the Department of Crop Sciences at the University of Illinois. As with any herbicide, application must follow all label directions and minimize off-target movement of spray particles. It is the responsibility of the applicator, whether private or commercial, to follow all label directions before, during, and after the application of dicamba. Hager notes that strict adherence to label instructions is in the best interest of maintaining the availability of this technology. Hager shares his thoughts for what success or failure for dicamba might look like in 2018. He provides the following steps to achieve success with dicamba in 2018. Plant dicamba soybean seed into a weed-free seedbed. This can be achieved through the use of preplant tillage, effective burndown herbicide(s), or a combination of tillage and burndown herbicides. Select and apply within 7 days of planting a soil-residual herbicide that targets your most problematic weed species. If desired (and labeled), add dicamba and an appropriate buffer. Soil-residual herbicides that offer excellent, good, and acceptable control for waterhemp and Palmer amaranth are listed on the Bulletin. Additional details can be found in Hager’s original post on the Bulletin, at http://bulletin.ipm.illinois.edu/?p=4065.